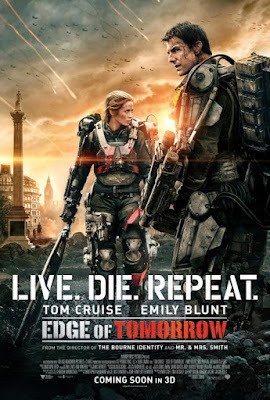 I never imagined I'd be reviewing the Tom Cruise, Sci-fi action movie, Edge of Tomorrow (2014), three years after its debut but, after seeing it on Netflix, the film is so good I now wish I had seen it in a cinema back when it was released. Perhaps this film didn't do so well in the USA (it fared better internationally) because of the mixed reactions to the previous Tom Cruise Sci-fi movie, Oblivion (2013), which I did see in a cinema and also thought was exceptional. If I was to compare the two films, Oblivion is more visually interesting, conceptually, with its production design, but Edge of Tomorrow has a more engaging story that keeps you thinking about every choice the lead character is making. Tom Cruise plays Major William Cage, the US Military's media spokesperson who, for reasons I didn't quite understand (some higher up didn't like the fact he'd never seen battle I think? ), is forced to fight on the front line of an alien invasion in Europe. In his very first battle he dies, except he doesn't, instead he wakes up at a point in time a day before his first battle and relives the day... again, and again, and again. The film is basically Groundhog day (1993) meets Starship Troopers (1997) only the combination makes for a much more interesting movie than either of those films on their own. Particularly the explanation for why Cage is reliving the same day over and over (which isn't properly explained in Groundhog Day). What's notable about the film is Tom Cruise isn't playing his usual confident, capable action hero, persona. This role is left to Emily Blunt who plays special forces soldier, Rita Vrataski, who we learn early on, was able to down hundreds of aliens in her very first battle. Cage, on the other hand, is a real fish out of water, once he goes into battle. Whilst the concept design of all the future tech and even the aliens, is not too far removed from things seen in similar science fiction films it doesn't really matter. I found the story so engaging as we learn how Rita was able to be so successful on her first mission and why Cage isn't able to be remotely as capable in his first battle. Learning with Cage, about his predicament, including what caused it, and how it can be used to the allies advantage is quite compelling. Although Cage repeats the same day over and over, the editing of the film is done so well that you never get sick of seeing the same scenes play out again and again. In fact, often, most of the day is implied to have happened and you only see the bits where Cage tries to do something different. If you didn't see this movie in a cinema I'd highly recommend it to you as a film worth your time (especially if you have it on Netflix or some other streaming service). It's a solid sci-fi film with Tom playing against type and Emily Blunt, probably playing against type too (I don't think she'd done too many action films where she's the hero warrior by this point). It's easily underrated and deserved to have done a whole lot better in its theatrical release.